Oh, if there ever was a situation when I wanted to throw myself to the ground and howl like a toddler who is denied a lolly, then this was it. Fences of organ pipe cacti (on the left) frame plantings of opuntias that act as house plants for cochineal insects. They produce highly-prized, crimson-colored dye of carmin that was exported by the Spanish and used for fine paintings and as a dye for carpets and silk. I'd been wanting to see Jardín Etnobotánico in Oaxaca for a long time, and it was one of the main reasons we chose to visit this beautiful, UNESCO World Heritage recognition worthy little town in South Mexico despite its slightly inconvenient distance from our present hometown. And yet, I arrived behind the garden gates during the announced time for English speaking tours, highly excited about at last getting to see this magnificent garden - sometimes called the best ethnobotanical garden in the world - only to be met by large signs telling that it would be closed indefinitely due to striking state employees. The gates stayed closed during our whole stay, and the strikers seemed to have a good time under their shady canopy, watching TV and listening to rowdy music. They showed absolutely no sympathy to my anguish, and happily continued exercising their democratic rights to my - I'm a little ashamed to say - utter irritation. The only glimpse I got of the garden was a bird's eye view from the second floor of the adjoining museum; it was brief, but still long enough to convince me that the reputation of this magnificent garden is well-deserved. The Jardín Etnobotánico de Oaxaca tells the story of interaction between plants and people of the Oaxacan state that is famous for its ceramics, food and textiles. Plants have been an important part of its culture since the ancient civilizations of the Zapotec and other indigenous people who inhabited the area. Cycads and other palms that provide both food and fibres for textiles. Cacao and vanilla are only two of the countless plants used for food production in Oaxaca... and that I missed seeing in this fantastic, architectural garden. Nothing happens without a reason, some say.... so I just might have to go back to Oaxaca. 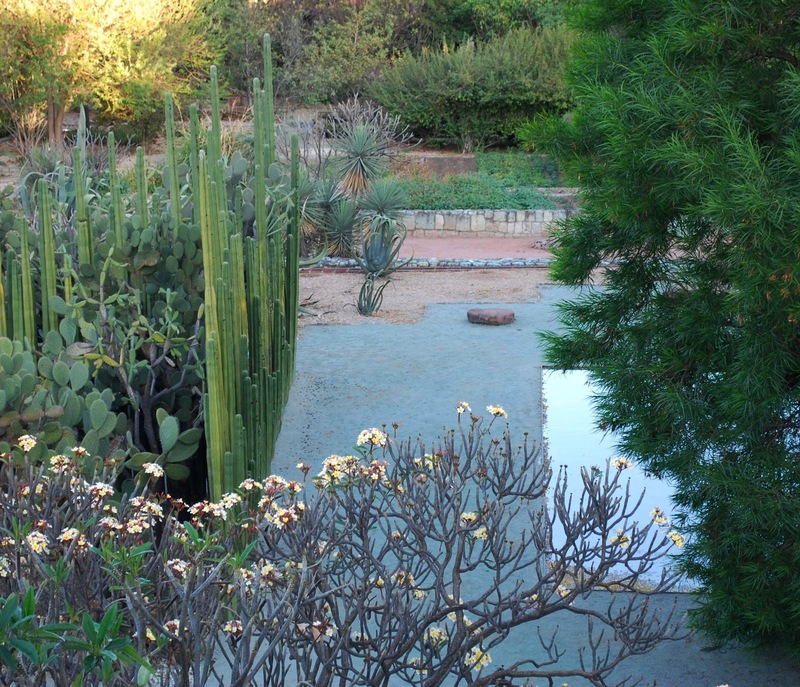 More information about visiting this garden: http://jardinoaxaca.org.mx/. Those glimpses are beautiful. I'm now a convert and must get there some day. It looked really interesting and beautiful, I love the way they tell the story of the region through the plants. Oaxaca is well worth a trip, so I will be going back, too. Alejandro, Thank you for contacting me. This was such an unhappy coincidence to happen, but I understand it was out of your power to do anything about. Hopefully all plants in the garden survived the strike. I hope to be back soon, as I think it was extremely inspiring. Best regards, Liisa. I love your garden blog! I am so glad to have found you - Jan Johnsen, my blog is Serenity in the Garden.